Oy, with the poodles already! Gilmore Girls: A Year in the Life, the highly anticipated Netflix revival of the beloved series, is HERE! Throughout the show's seven seasons, Lorelai and Rory go through their fair share of hardships and triumphs, and so do their wardrobes. Their clothing choices help to portray the season of life they're in, from Lorelai's short-shorts and tie-dye t-shirt ensemble when going to meet Headmaster Charleston, to Rory's exceptionally conservative fashion choices during her semester off from Yale. Through it all, they stayed true to themselves, even when their outfits drew a second glance, or elicited a snide remark from Emily. To help get you in the Stars Hollow spirit, we've rounded up some of our favorite fashion moments from the show, some of which could provide inspiration for your own wardrobe. If the previews are any indication (or if you've already binged watched the episodes), the fashion in the revival will be just as rich as it was in the original. Let your style reflect your energy. The one that started it all. The now infamous tie-dye t-shirt and Daisy Dukes perfectly captures Lorelai's rebellious spirit, especially compared to Rory's school uniform. Oh mom. Dress for the formal you wish you had. If only school dances actually looked like the ones Chilton hosted and we all had a mom who knew how to make us amazing dresses to wear to said dances...having a date like Dean wouldn't hurt either. Sometimes, wear what is required. The fashion show was a huge step in Lorelai and Emily's relationship. In her younger years, Lorelai may have scoffed at the very idea of ever doing anything to assist her mother, but she reached a point where she was reluctantly willing to help her. Even if it meant publicly humiliating herself in a red suit. How many shrugs and wrap dresses does Lorelai Gilmore own? The limit does not exist. No matter what's going on in her life, this outfit combo is a constant. When you are trying to figure out who you are, you can turn to your closet. While Rory never quite cared for flash as much as her mother, during her semester off from Yale she dressed uncharacteristically conservative. The Daughters of the American Revolution got to her a little too much. No matter the occasion, always do you. The dress that dreams are made of. While this one never actually made it down the aisle, maybe we'll have something to look forward to in the revival (we promise, no spoilers!). Also, snaps to Lorelai for picking a blush pink gown years before colored wedding dresses widely accepted. What a trendsetter. If you want to be Editor-in-Chief, dress like it. 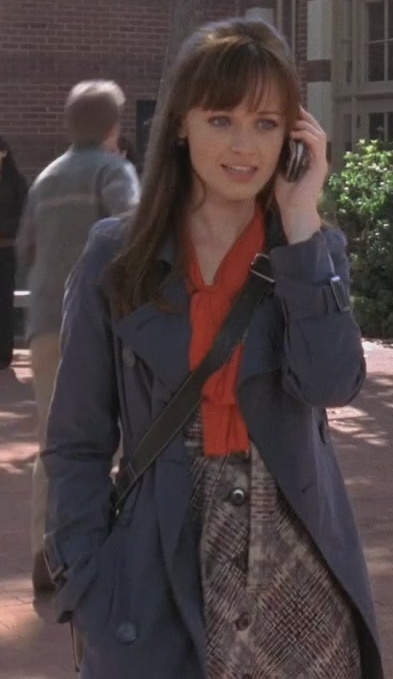 One of my favorite things about Rory is that she always dresses for the job she wants, not the job she has. Christiane Amanpour would be pround. Now that you're fully caught up on the fashion choices of our two favorite leading ladies, go grab a pop-tart and get ready hear the final four words. Finally.